And the break continues…and a few pictures of what I did. | Read.Write.Discuss.Repeat. And the break continues…and a few pictures of what I did. I spent Monday with my girlfriend, which was awesome and very relaxing. Having no work the next day was a refreshing change as one or both of us usually has to get up early the next morning. Tuesday was the day I visited the famous, and largest in Europe, set of Christmas markets in Manchester. It does have a daft amount of stalls but I usually only end up buying some fudge and a huge rocky road muffin. I’ve not bought any fudge yet but I did buy a smartie chocolate muffin the size of my head which was gone in no time. I managed to buy a Christmas jumper and a present for my nephew as well. Then, in the evening, I did nothing at all. It was lovely. Thursday which saw me going to watch West Side Story at the Palace Theatre in Manchester with my girlfriend. I’ve wanted to see a big show at the theatre for years and she made that want happen by getting us tickets for a birthday present for me back in June. I wanted to see a show that was established and up to a high standard. The show was everything I hoped it would be and I enjoyed every minute of it. Thanks again Michelle. Now on to Friday when I went to Leeds with a few friends to celebrate another friends birthday. 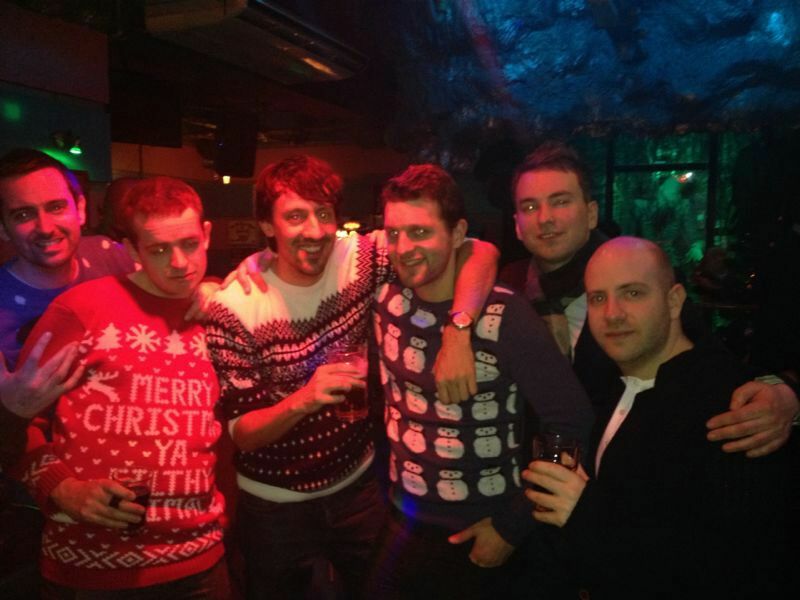 We started drinking on the train there and polished off a fair amount of alcohol before we eventually went out in Leeds in our Christmas Jumpers. 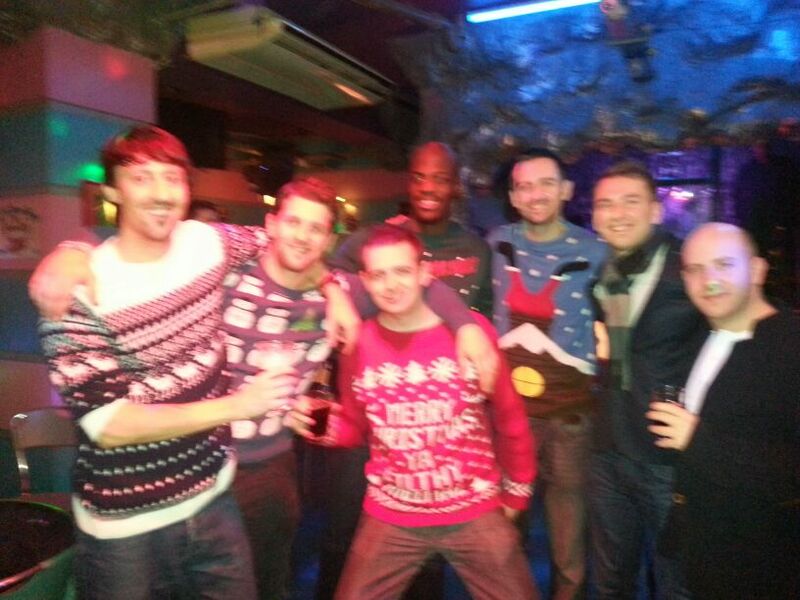 That night rolled on nicely as wearing those jumpers got us and everyone around into the Christmas spirit. The Saturday consisted of more alcohol and pizza followed by another night out. 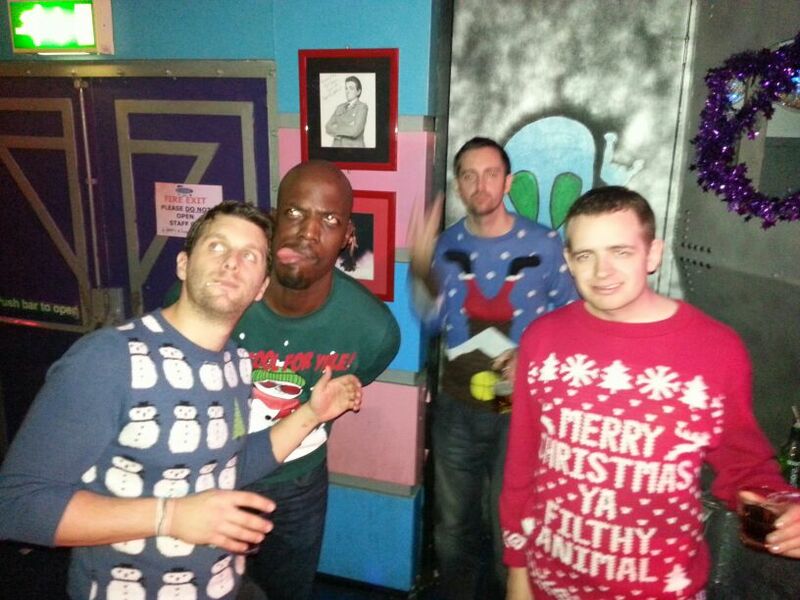 Out of the two nights, I preferred the Christmas Jumper one. The reason being I got chucked out of a bar on the Saturday night for something I didn’t do. Some bint accused me of pushing her off a chair. And managed to mistake me, a six foot, bearded man with short brown hair, with a five foot nothing bloke with long blond hair and no beard. How could this happen you may ask? Because we were both wearing black tops. She knew the manager so I got shown the exit. Even the bouncer said it wasn’t me. I could explain more but I may start to ramble and become more angry and go round trying to push more people over. So here are a few pictures instead. 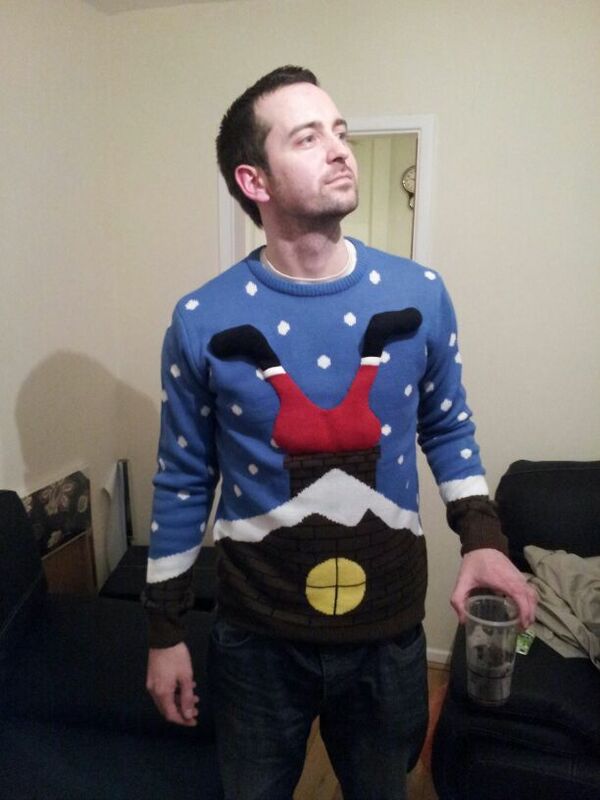 This is me being proud of my Christmas jumper. Just before we went out. This is me and a few mates. Not sure what we’re doing to be honest. By this point we were all fairly drunk and one of us had gone missing. It turned out he’d just gone home. This one was from Saturday night. 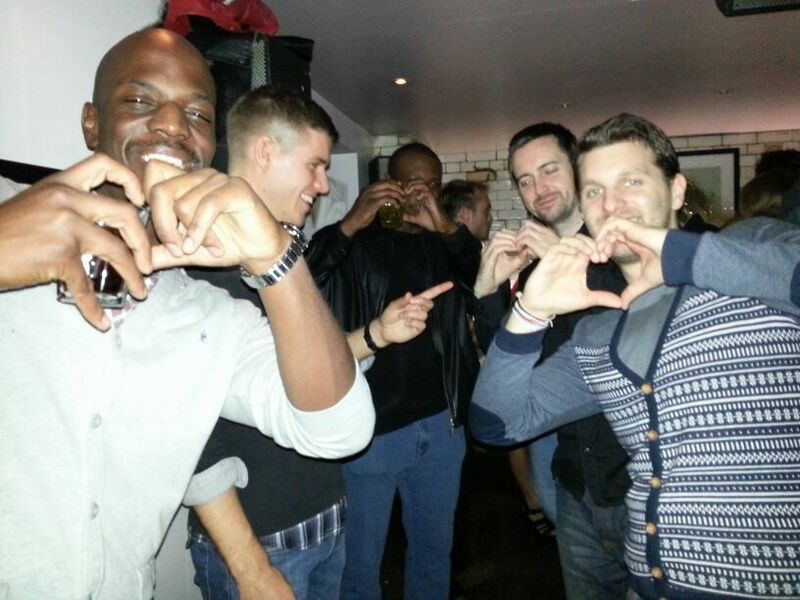 I didn’t get many good pictures but this is us trying to do Gareth Bale’s heart celebration thing he does when he scores. Only a few of us managed to master it. Dan at the front, who’s birthday weekend it was, hand’s seem to have fallen apart when he tried it. Well, that’s all from me. Hope you enjoyed a small slice of my life. Good luck as always with your writing and see you soon.